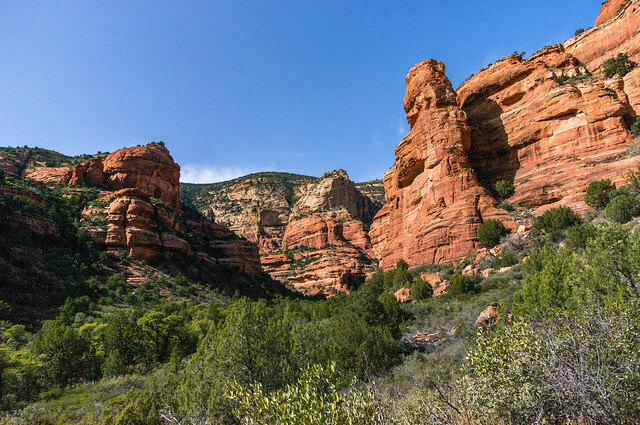 Fay Canyon is a favorite hike for many who prefer a shorter hike with minimal elevation gain or who enjoy the grandeur of red sandstone walls towering overhead. Some people visit Fay Canyon to see the natural arch located just under a half mile up the trail. Those who don't know about it usually walk right past. Though the Fay Canyon Arch is by no means small, it looks so much like an ordinary rock overhang, it's easy to glance right at it and not realize what you've seen. If you keep watching the rock wall to the north (right) side of the trail sooner or later you'll spot it. This small, hidden canyon supports a diverse community of desert plants and provides good views of the surrounding cliffs. It dead ends at a red Supai sandstone cliff. Throughout Fay Canyon you can marvel at the breathtaking scenery that surrounds you. Location: 33 miles south of Flagstaff (2.5 miles west of Sedona) in scenic Red Rock Country on roads that are paved. Elevation is 4500 feet. Access: Drive 27 miles south from Flagstaff to Sedona on US 89A. Continue through Sedona to Dry Creek Road (152C) at the west end of town. Turn north three miles to the Boynton Canyon intersection then left about a half mile to the Fay Canyon parking area on the left. Cross the street to the trailhead. Notes: No mechanized vehicles (including mountain bikes) in Wilderness. This trail can be hot and dry in summer. Please do not disturb ruins or remove artifacts.